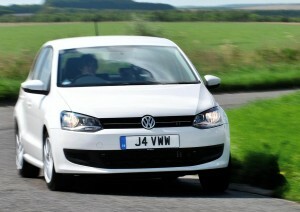 New VW Polo R-Line 2013: VW Polo City Car Range Updated! Volkswagen is offering extra standard equipment on its Polo models, along with the introduction of the stylish yet economical Polo R-Line Style. The move makes the Volkswagen Polo and even more attractive package – especially the super-frugal VW Polo BlueMotion and the value-packed VW Polo Match which now have rear parking sensors, cruise control and an alarm. Though the Match has been renamed as the VW Polo Match Edition, to indicate its enhanced specification. The additional equipment is worth £510 but the models will only see a premium of £135 with the Volkswagen Polo 1.2-litre 60 PS three-door starting at £11,910 OTR. Further up the VW Polo range, the SEL, R-Line, BlueGT and GTI models all now come with cruise control and rear parking sensors as well as an alarm which, as before, remains standard equipment without any increase in price. As well as these enhancements, a new model joins the VW Polo line-up: the Polo R-Line Style. As the name suggests, the R-Line Style packs all of the great looks of the Polo R-Line, but with equipment and engines that make it even more accessible and prices starting from £11,740. Based on the VW Polo S, the Polo R-Line Style adds the R-Line body kit – which consists of distinctive bumpers, a bespoke radiator grille and side skirts – body-coloured door handles and door mirrors, 16-inch alloy wheels and a Bluetooth touch phone kit. As on the Volkswagen Polo S, air conditioning is an option on the Polo R-Line Style. VW is also offering an attractive financing and servicing package to help persuade buyers but anyone thinking of buying one (and the Volkswagen Polo is a great car) should check out the leasing options first. This entry was posted in Eco Car, Manufacturer News, Popular Cars, Small Car and tagged air conditioning, alloy wheels, bluemotion, car, eco car, eco polo, GTI, high mpg car, lease a vw polo, New VW Polo R-Line Style, price, SEL, TSI, Volkswagen, Volkswagen Polo, vw polo, VW Polo Match Edition, vw Polo R-Line Style, VW Polo R-Line Style 2013, VW Polo R-Line Style Engine, VW Polo R-Line Style Price, VW Polo R-Line Style Spec, VW Polo Range, VW Polo Range 2013, VW Polo S, VW Polo Update by Steve Lumley. Bookmark the permalink.